The island of Paros in the central Aegean sea of Greece, belongs to the group known as the Cyclades. 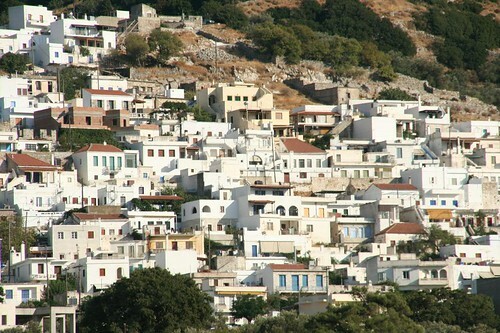 About 100 miles from Pireaus, the port of Athens, the Paros community also includes the island of Antiparos to the South-west and several nearby uninhabited islets (e.g. Gaiduronisi – donkey island, Portes – doors island, Tigani – frying pan island and Drionisi). Paros was historically known for its excellent quality pale-white marble, but today it’s mostly a tourist haven. Historically, although Paros was a mainly a very wealthy Greek island in antiquity, it actually sided with the Persians more than once when they attempted to overtake Athenian Greece. The Paros temple of Demeter, goddess of harvest, was where one of Athen’s finest generals Miltiades received his fatal wound. Eventually the Roman and then Byzantine Empires took over Paros and Venetians then Ottoman Turks followed. Its release back to Greece in 1832 is associated with the local heroine Manto Mavrogenou, whose house near Ekatontapiliani church is a historical monument worthy of visiting. The capital Parikia has lovely traditional whitewashed houses with blue doors, window frames and shutters and is also the main port with direct connections to Pireaus, Heraklion in Crete and most of the nearby larger islands, which make for lovely day trips. Parikia is also full of antiquities in various states of preservation. The town’s principal church, currently used for Christian Orthodox ceremonies, was most possibly originally founded by the Romans around 300 AD. The town’s small archaeological museum is quite interesting for local history artefacts, some from as far back as 1500BC. Visit the pretty harbour bay of Naoussa (Agoussa) in the north side of the island, the “villages of Kephalos” (Dragoulas, Mármara and Tsipidos) for their rich remains of antiquity and the celebrated marble quarries on the northern side of mount Capresso. 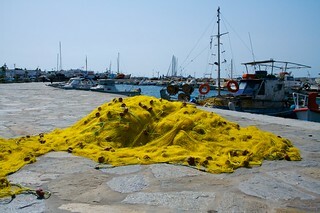 The fine Paros marble is today used mainly for archaeological restorations. 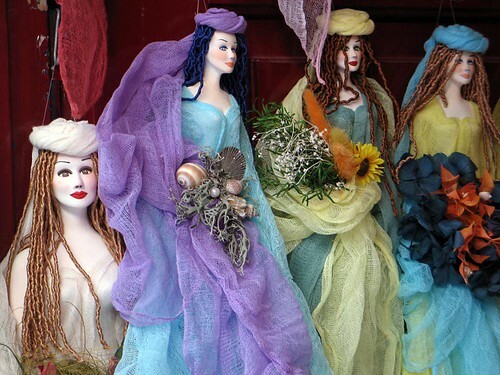 The term Paros dolls refers to the fine white marble/porcelain type appearance of these pieces of art. 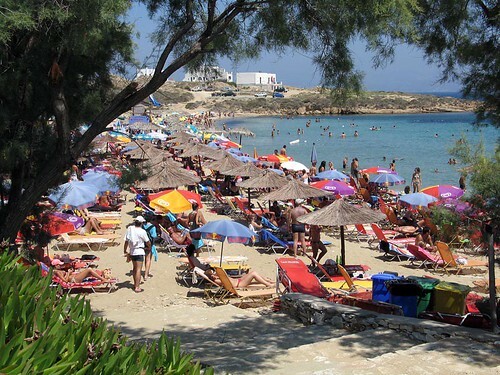 For beaches, choose from Chrissí Aktí (golden beach) on the East coast by Drios, or Naoussa Bay, Agia Irini and Parikia. If you’re into wind-surfing, you won’t go far wrong if you opt for any beach in the strait between Paros and the nearby island of Naxos, as they all have a relatively constant strong wind, particularly around lunchtime on any of the many sunny days.